Egypt’s Minister of Foreign Affairs Sameh Shoukry participated in a ministerial meeting held in New York on Thursday for the Ad Hoc Liaison Committee (AHLC), which is in charge of coordinating access to international assistance for Palestine. His speech was delivered to the meeting, held during on the sidelines of the 73rd United Nations General Assembly (UNGA). In an official statement Ministry of Foreign Affairs spokesman Ahmed Abu Zeid said Shoukry praised US international action and projects for the coordination of aid to Palestinian people by AHLC. He added that such aid should be outlined in a timetable that provides solutions for emergencies faced by Palestinians. He noted Egypt’s constant keenness to undertake action to ease the humanitarian crisis in Palestine, as well as their commitment to improving the economic situation and living standards in the West Bank and Gaza Strip. The foreign minister also accentuated the importance of moving forward with Palestinian national reconciliation, supported by Cairo. Reconciliation would accomplish unity and end internal division for the purpose of positively influencing the peace process to reach a fair and comprehensive resolution for the Palestinian cause. 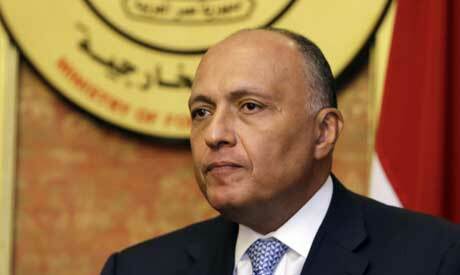 Shoukry stressed the importance of a political resolution, accompanied by humantarian aid, to solve the crisis. He affirmed the necessity of a suitable climate for talks, and a guarantee from all involved parties to uphold agreements on the ground. The Ad Hoc Liaison committee was established in 1993 by Norway, EU, UN, World Bank and the IMF to promote dialogue between donors and the Palestinian people. It has been on alert since a decision by the US in to hold back $65 million - more than half its planned contribution this year - from the United Nations’ Relief and Welfare Agency (UNRWA), demanding that the agency make as yet unspecified reforms.